How did a mammogram as a screening tool fail me? Recorded July 1, 2009 – less than a month after my diagnosis and 2.5 weeks before my second surgery. “Studies show that as breast density increases, so does the risk of breast cancer. Breast density refers to the proportions of fat and tissue in the breasts as seen on a mammogram. High density breasts are those that have a greater proportion of tissue than fat. Low density breasts have a greater proportion of fat than tissue. 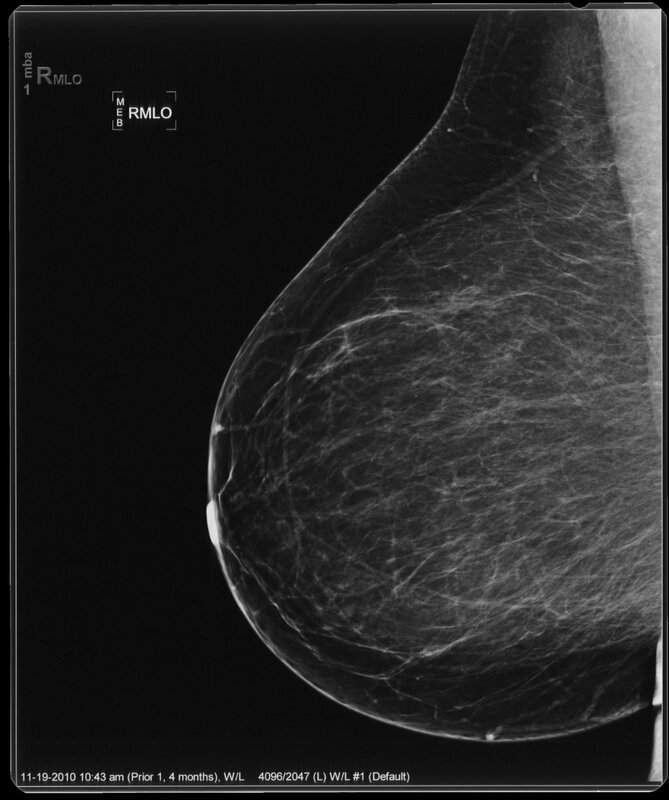 Women with very dense breasts, as assessed by mammography, are four to five times more likely to develop breast cancer than women with low density breasts. Mammographic density (also called ‘breast density’) is a term used to measure and compare the different types of breast tissue visible in a mammogram. Breasts are made up of several tissues, including fat, glandular tissue (the milk ducts and lobules) and connective tissue, which helps hold everything in place. Glandular and connective tissue are denser than fat, and this difference shows up on a mammogram. Breasts are defined as ‘dense’ on a mammogram if most of the tissue making up the breast is glandular/connective tissue, and there is little fatty tissue. High breast density means there is a greater amount of glandular and connective tissue compared to fat. Low breast density means there is a greater amount of fat compared to glandular and connective tissue. Henda’s mammogram with a 4cm tumor. Small titanium ribbon was implanted before breast surgery to mark the location of the tumor. Low density breast clearly showing a tumor on a mammogram. Low density breast with no noted tumors present. 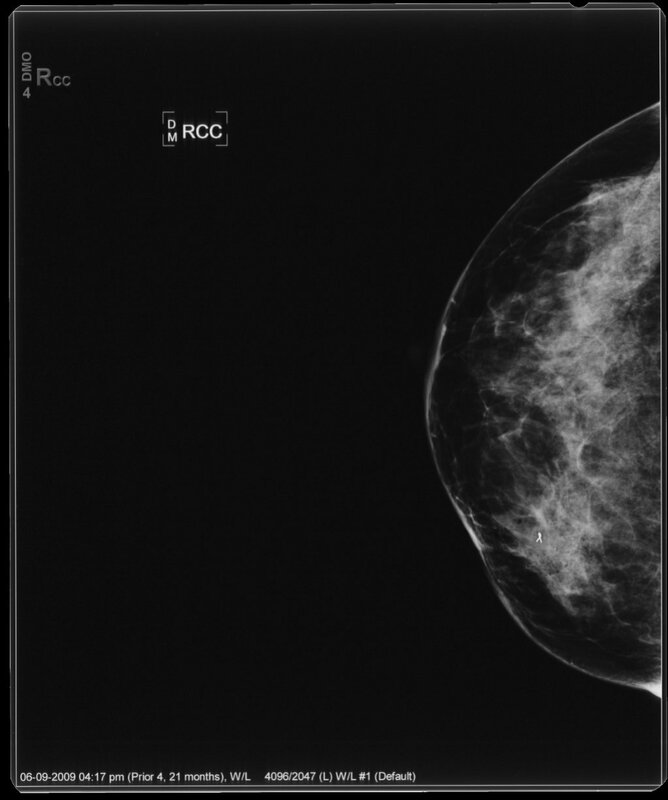 How does dense breast tissue look on a mammogram? Mammographic density (MD) only describes how breasts look on a mammogram. It isn’t a measure of how the breasts feel, and it cannot be determined in a clinical exam by a doctor. Although breast density varies from one woman to the next, younger women and women with smaller breasts are more likely to have dense breasts. For a lot of women, breasts become less dense after menopause. Type 1 (almost entirely fatty, the lowest density): around 10 per cent of women who undergo a mammogram will have mostly fatty, very low density breasts. Type 2 (scattered areas of fibroglandular density): roughly 40 percent of women who undergo a mammogram will have this low level of density. Type 3 (heterogeneously dense): another 40 percent of women will have this type of mammographic density, which is considered dense. Type 4 (extremely dense): around 10 per cent of women undergoing a mammogram will have extremely dense breasts. As this shows, there is a wide range of MD. Some breasts are mostly fat and some breasts are mostly breast and connective tissue (dense breast). But most women who undergo a mammogram (around 80 per cent) will be somewhere in the middle of these two extremes. Mammographic density varies widely from one woman to the next but in each woman, density levels tend not to change much across their lifetime. This is because an individual woman’s level of mammographic density is thought to be mostly determined when the breasts first form, due to genetic factors. Some factors can influence MD levels to some extent. Young women and women with a lower body mass index (BMI) tend to have higher MD. Other factors that can influence mammographic density to some extent include having children, being on hormone replacement therapy, and going through menopause. All of these factors can change hormones in your body and influence mammographic density to some degree. However, while a woman’s mammographic density can decline slightly with age, environmental influences or hormones, MD is mostly determined when the breasts first form, so some women will always have a high MD for their age or compared to the average, while other women will have lower MD. How does mammographic density affect your risk of breast cancer? Cancers can sometimes be hidden or ‘masked’ on a mammogram image if the breasts are very dense. 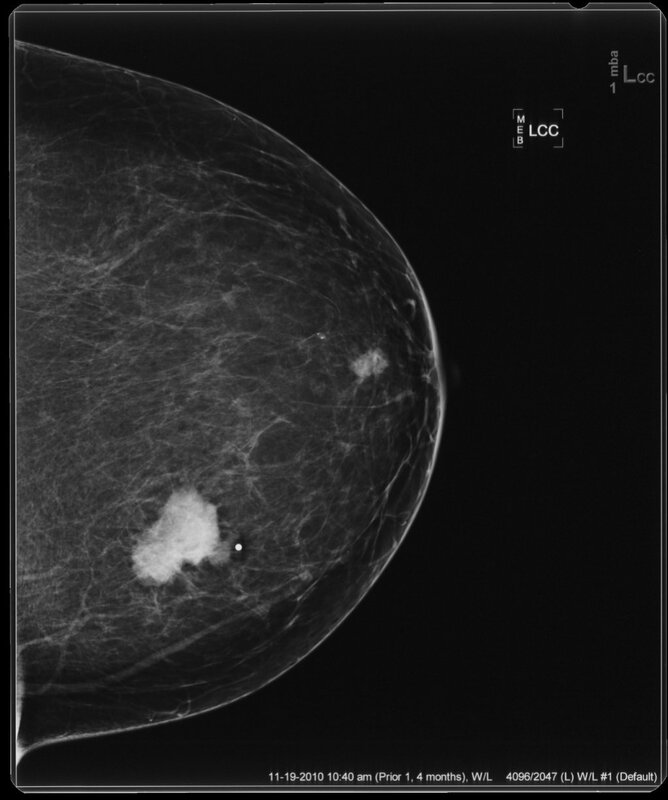 On a mammogram, fatty tissue appears as dark, and glandular and connective breast tissue shows up as white, or ‘dense’. Cancers also show up as white, or bright, on a mammogram. This means it is harder to pick up cancers on mammograms of dense breasts than mammograms of mostly fatty breasts. Research also shows that breast density can itself be a risk factor for developing breast cancer. For the approximately 40 per cent of women who have ‘heterogeneously dense breasts’ (Type 3 on the BI-RADS scale), the risk of developing breast cancer is thought to be 1.2 times greater than average. Women with extremely dense breasts (Type 4) are 2.1 times more likely than average to develop breast cancer, and up to 6 times more likely than women with mostly fatty breasts.